The results for the bypolls in Uttar Pradesh, Madhya Pradesh, Karnataka, Bihar, Telangana, Maharashtra, Punjab and Tripura were announced on Tuesday. The Bharatiya Janata Party wrested the Muzaffarnagar seat from the ruling Samajwadi Party, which also lost the Deoband seat to the Congress in two of the three by-elections in UP. The SP managed to retain the Bikapur (Faizabad) seat when its candidate Anand Sen Yadav defeated RLD candidate Munna Singh Chauhan. In Deoband, the seat of Islamic religious school, Darul Uloom, the Congress worsted the SP when its candidate Mavia Ali defeated Meena Rana. The by-elections were necessitated in Muzaffarnagar, Deoband and Bikapur due to death of of SP MLAs Chitranjan Swaroop, Rajendra Singh Rana and Mitrasen Yadav last year. Another Independent candidate Sumel Singh Sidhu could only poll 2,243 votes. He had parted ways with AAP to contest the poll. The bypoll was held as the seat fell vacant after Congress MLA Ramanjit Singh Sikki resigned in protest against sacrilege of Guru Granth Sahib last year. Shiv Sena retained the Palghar assembly seat with its nominee Amit Ghoda defeating Congress candidate Rajendra Gavit by 18,948 votes. While Ghoda polled 67,129 votes, Gavit got 48,181 votes. The bypoll was necessitated following the death of sitting Shiv Sena MLA Krishna Arjun Ghoda. Ghoda passed away on May 24, 2015 following a heart attack and his son Amit was given a ticket by the Sena for the bypoll. Though it was a multi-cornered contest, the real fight was between Amit Ghoda and Gavit, former Maharashtra minister. The ruling Telangana Rashtra Samiti wrested the Narayankhed Assembly seat in Medak district from the Congress with its candidate Bhupal Reddy winning the seat by a margin of 53,625 votes. Congress candidate P Sanjeeva Reddy polled 39,451 votes while M Vijaypal Reddy of TDP got 14,787 votes in the constituency, considered a Congress bastion. The bypoll was necessitated following the death of Sanjeeva Reddy’s father P Kishta Reddy. The result came as a further boost to the TRS, led by Chief Minister K Chandrasekhar Rao, as the party had scored a landslide win in the recent Greater Hyderabad Municipal Corporation polls, bagging 99 seats of the 150-member civic body. Ruling Communist Party of India-Marxist won the Birganj assembly by-election in Tripura’s Gomati district, with party candidate Parimal Debnath trouncing his nearest rival BJP candidate by a margin of 10,597 votes. While Debnath secured 20,355 votes, BJP’s Ranjit Das polled 9,758 votes. Congress candidate Chanchal De got only 1,231 votes and his deposit was forfeited, Returning Officer Debapriya Bardhan said. The bypoll was held on February 13. The seat had fallen vacant following the resignation of the Manoranjan Acharjee from the assembly on December 10 last after he was expelled from CPI-M on charges of moral turpitude. Acharjee had allegedly molested an eight-year-old girl inside the party office at Amarpur sub-division late last year as per an FIR lodged against him, police said. Dealing a blow to the Congress in Madhya Pradesh, the ruling Bharatiya Janata Party has won the Maihar assembly seat in a by-election with party nominee Narayan Tripathi defeating the main opposition party's Manish Patel by a margin of 27,544 votes. Tripathi secured 82,703 votes while Patel polled 55,159 votes, an election official said. The outcome came as a double jolt for the Congress as Tripathi, after winning the seat in 2013 assembly polls, had quit the party to join the BJP during the 2014 Lok Sabha polls. Later, he resigned from the seat which necessitated the by-poll. elections, which analysts then took as a sign of declining fortunes of the long-ruling saffron party in the state. The win in Maihar is expected to enhance the confidence of the BJP in Madhya Pradesh where it heavily relies on the appeal of Chief Minister Shivraj Singh Chouhan. The victory comes just ahead of Prime Minister Narendra Modi's visit to Sherpur in neighbouring Sehore district on February 18, where farmers will felicitate him for launching new crop insurance scheme. Buoyed by the by-poll victory, Chouhan said at Sherpur, "I am thankful to the people of Maihar for this victory and will visit the town on February 22 to personally convey my thanks to them." For the Congress too, the by-poll in Maihar was a prestigious battle as it had won it in 2013 despite the BJP getting more than two-third majority in the state assembly. Traditionally, Maihar in Satna Lok Sabha constituency is seen as a Congress stronghold. The BJP, keen on wresting the seat from the Congress, fielded Tripathi himself for the by-election. The Congress also made its best efforts to ensure Tripathi's defeat by fielding Manish Patel, who had joined the Congress by quitting the Bahujan Samaj Party, seeking to consolidate backward class voters in the Brahmin-dominated seat, a strategy which failed to click. While the Congress had won the seat eight times since 1957, Janata Party, an Indpendent, Janata Dal, the Samajwadi Party and the BJP tasted victory once each. Tripathi bagged the seat for the Congress in 2013 by a margin of 6975 votes by defeating BJP's Ramesh Prasad. The chief minister had campaigned vigorously in the last three-four days in Maihar to ensure the BJP's victory. The BJP's Motilal Tiwari won it in 2008. Others in the fray this time included BSP's Ram Lakhan Singh Patel, a former member of Legislative Assembly and the SP's Ram Niwas Urmalia. In a setback to Chief Minister Siddaramaiah, the ruling Congress in Karnataka has won one seat and its rival, the BJP two in the fiercely-fought February 12 assembly bypolls. In the direct fight, the BJP retained Hebbal in Bengaluru and wrested Devadurga in Raichur district from Congress which snatched Bidar in north Karnataka from its arch rival. Of the three seats that went to by-polls due to the death of sitting members, the BJP had held two and Congress one. The outcome has come as a blow to Siddaramaiah considering the prestige invested in the contest to wrest the seats from the BJP. Bogged down by infighting, former Prime Minister H D Deve Gowda-led JD-S lost deposit in all the constituencies. BJP candidate Y A Narayana Swamy defeated his nearest Congress opponent C K Abdul Rahman Sharief, grandson of former Railway Minister C K Jaffar Sharief, by a margin of 19,149 votes in Hebbal. In Bidar, Congress' Rahim Khan triumphed by a margin of 22,721 votes, defeating his closest opponent Prakash Khandre of the BJP. K Shivana Gouda Nayak of the BJP defeated A Rajashekhra Nayak of the Congress by a margin of 16,871 votes in Devadurga. Speaking to reporters in Mysuru, Siddaramaiah said he will "bow" to the verdict of the people but said that the verdict would have no bearing on his government. Home Minister and also state Congress Chief G Parameshwara said the party will introspect about its loss in two seats. "We aimed to win all the three but expected at least two but the outcome is not that way. We will introspect and find reasons about loss in two seats," he said. BJP leader Prahlad Joshi said it was a vote against the "arrogant conduct" of Siddaramaiah while another party leader and former Chief Minister Jagadish Shettar claimed it was an indicator of the future political direction in the state. 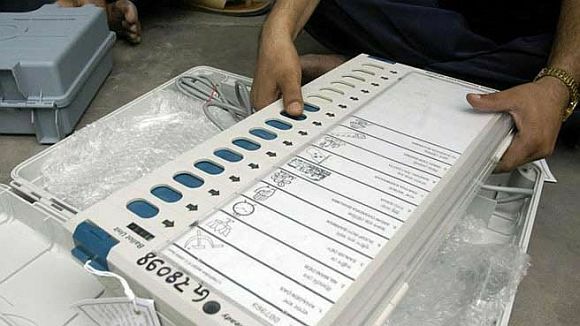 Amid by-election results, all the three parties are also pinning hopes on Zilla and Taluk Panchayat elections outcome for which the first phase of polls in 15 districts were held on Friday. The second phase of polling for the rest 15 districts will be held on February 20. The results will be out on February 23. The Congress, a part of the ruling grand secular alliance in Bihar lost Harlakhi assembly bypoll to BJP ally Rashtriya Lok Samata Party. The secular alliance suffered the jolt just about three months after its stupendous victory in the state assembly election. Union Minister Upendra Kushwaha-led RLSP candidate Sudhansu Sekhar riding on a sympathy wave defeated his Congress rival Mohammad Shabir by a margin of 18,650 votes. Sudhansu Sekhar's father Basant Kushwaha had died a day before oath taking in November last year. Returning Officer Bishnudeo Mandal said while RLSP nominee polled 62,434 votes, the Congress candidate bagged 43,784 votes and CPI nominee Ram Naresh Pandey secured 19,835 votes. The victory margin of the RLSP candidate is almost five times more than that of his father, who had defeated the same Congress candidate in October-November poll by about 3,600 votes. Whose year will it be in 2016?